Thor is just a simple Viking god who doesn''t much like to over-complicate things with flashy colors and complex designs, and that''s why he approves so much of this great pint glass! 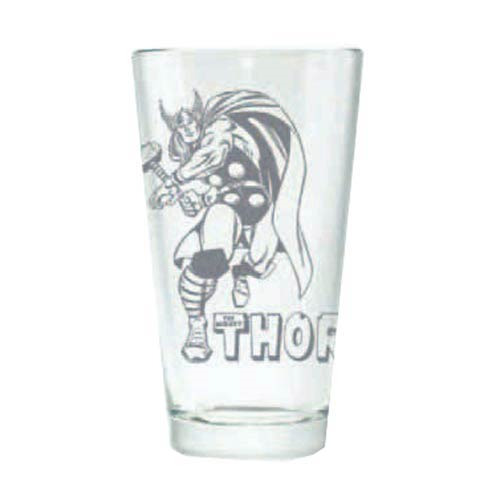 The Mighty Thor Hero Logo Etched Pint Glass features The Mighty Thor logo beneath the god of thunder, Thor, in mid-battle. Etched into the glass, the design is nice and minimalistic - not over-complicated with graphics and colors! So your mind can busy itself paying attention to other things, like making your mischievous brother behave, or chasing after a pretty group of Valkyrie. Pint glass holds up to 16 ounces of liquid. Hand wash only. Not dishwasher safe. Do not microwave. Ages 12 and up.